Leicester City and Super Eagles star Ahmed Musa has divorced his wife and mother of his two children, Jamila, according to SCORENigeria. This followed a muchpublicised disagreement between husband and wife at their home in England this month. 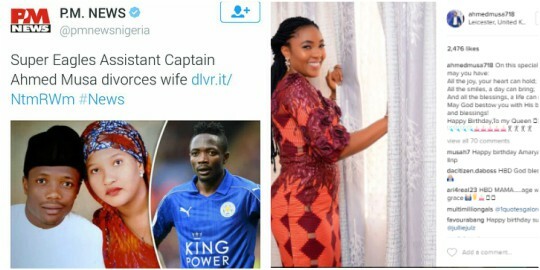 A top source told only SCORENigeria: “Ahmed Musa has divorced his wife. “He gave her Saki Uku (which in Hausa literally means a final divorce). She is based in Lagos and she is from Calabar, a competent source told SCORENigeria The website also reported that the football star had paid off his former wife by giving her one of his houses in Kano as well as a recent model Honda car. It also reported that Jamila could have got a huge slice of Musa’s fortune, but she turned down that chance after several human rights lawyers approached her in England to give them the mandate to sue her husband on her behalf. “She rejected all their approaches,” another source informed. It was reported that both Musa and Jamila lived on the same street in Kano before they started courting. good girl, just say no to those lawyers, kudos to you! musa may regret it later, calaber girl??? hmmm, in next 5 years or less musa who understand the meaning of calabar girl! Ok ooo, but hausa pple wit second wif sef, is it a course? ?? ARE YOU NOT ASHAME OF YOURSELF? YOU WANT TO MARRY 4 WIVES, WHO WILL HELP YOU SATISFY THEM? DON'T MIND THAT PIG, HE NEVER SATISFY ONE WOMAN NOT TO TALK OF 4 WIVES. Calabar girl hmm, he may not know what a good wife he had until it is late. Wetin come be your own? Solomon for Bible no even get team of women, him start him own league. Genghis khan wey almost half of Chinese people fit trace their lineage to nko? Abeg Gogoman fire down. If he belly full you, send me private message make I fall in too. I pity Ahmed MUSA. Calabar girl don give am NOKUMI and him chop am well well. His ex wife seems to be a good wife but love portion scattered Ahmed Musa's brain. I pray this won't be the beginning of the end to his football carrier. GOD IS WATCHING OOOO!